Great finger food or the perfect starter for a dinner party. 3 tbsp finely chopped shallots. 3 tbsp finely chopped ginger. 1 tbsp finely chopped chives. Mix together the shallots and ginger and leave for 1 hour for the flavours to infuse. Add the soy sauce and olive oil to make a paste. Set aside. Use a knife to break the crackers into pieces about 4cm by 6cm. 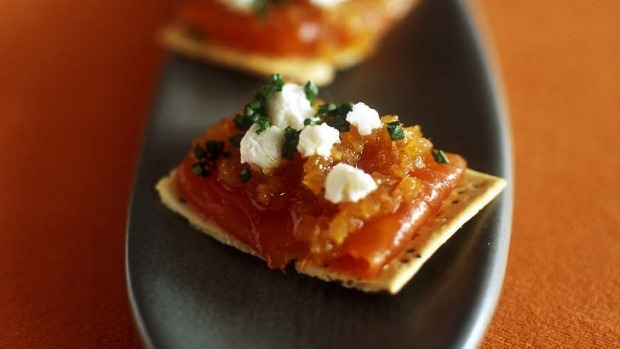 Cut the salmon into 3mm thick slices and lay on the crackers. Spread some ginger paste (about half a teaspoon) over the salmon then sprinkle with a little feta and chives. Serve immediately.